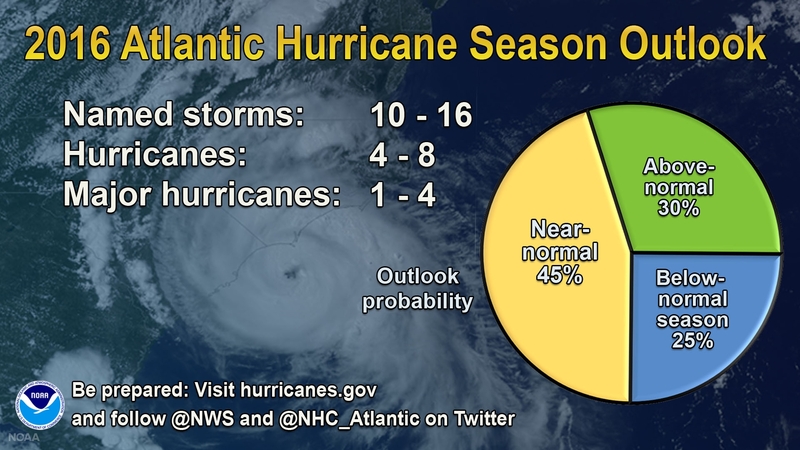 Hurricane season officially begins June 1, and the National Oceanic and Atmospheric Administration (NOAA) has issued its forecast for 2016, predicting a 70% likelihood of 10 to 16 named storms. Officials have categorized this season, which runs through November 30, as “near-normal”. The forecast predicts between four and eight storms may become hurricanes, with winds over 74 mph, and between one and four of those may become major hurricanes, with winds of at least 111 mph. However, 2016 already saw its first hurricane in January with the formation of Hurricane Alex in the Atlantic. Tropical Storm Bonnie made landfall on May 27, making it the year’s second named storm. Two factors could, however, impact the forecast – the El Nino/La Nina cycle, and the Atlantic Multidecadal Oscillation (AMO). Both influence ocean temperatures and wind patterns. Forecasters anticipate one of the following three scenarios developing, with the first the most likely. 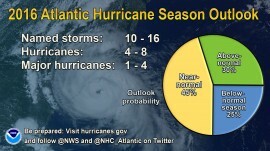 NOAA indicated they will provide an updated outlook for the Atlantic hurricane season in early August. The Waltz Law Group has been selected by A.M. Best for inclusion in its 2014 list of Recommended Insurance Attorneys.